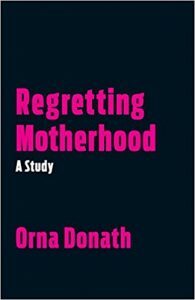 Based on Donath’s interview research between 2008 and 2013, Regretting Motherhood does not focus on women who have wrestled with the difficulties of motherhood; she interviews women who speak candidly about why they feel becoming a mother was a mistake. 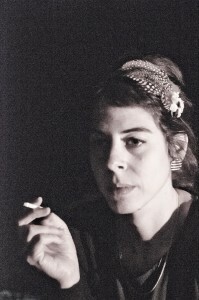 Donath interviewed 23 women living in Israel, ages 26-73, all Jewish, and from a range of socioeconomic, educational and professional backgrounds. Five of the women had one child, eleven had two children, four had three children and three had four children. The children’s ages ranged from one-year-old to forty-eight. Scholarly yet accessible, Donath makes it clear that she did not intend for her study to “present a representative sample that would allow us to create generalizations,” but instead to “sketch a complex roadmap that would allow mothers from diverse social groups to “locate themselves on it” to allow “a variety of subjective maternal experiences to exist.” In six chapters she weaves her examination, discussion and commentary with poignant interview excerpts. As someone on a mission to expose pronatalism and its huge costs to humanity and the world, I admire how Donath shines bold light on how society pushes women into motherhood, and how women who end up wishing they had not made this choice struggle internally and externally in our pronatalist society. In part, taking on motherhood regret challenges what I call the pronatalist Normality Assumption. It pushes the lie that all women have an instinctual desire to become mothers. People unquestionably believing this notion results in an array of negative consequences. Regret is one such consequence. The Normality Assumption dictates that something must be very wrong with you if regret becoming a mother. So when women believe this and feel regret, much suffering ensues. The chapter, “Paths to Motherhood,” examines pronatalist expectations Western societies have for women to become mothers. Donath and interview excerpts highlight the different routes women may take toward motherhood, even when they may already know they don’t want to do it. She challenges the notion that the transition to motherhood must be due to a woman wanting to become a mother, and shows readers how women’s stories play out more complicatedly than that. The “Demanding Motherhood” chapter looks more closely at the outside “social rules” that govern motherhood. Donath and the women’s voices do a great job at examining why the rules’ power lies in how women internalize them. Like no other author I have read on this subject, she also makes important distinctions between motherhood ambivalence and regret, and why we even need to make the distinction. Donath then gets directly into regret from a number of different avenues in Chapter Three. She discusses how it is “an integral component of human relationships,” how it can be “experienced in every realm of life,” and wisely questions why motherhood regret can’t be one of them. Reading her examination of how “regret is used in a society that encourages and demands birth” will give you pause. Chapter Four, “Living with an Illicit Emotion” delves into the notion that having children should make women feel “complete,” but not for the women in this study. The commentary from the women helps us understand the dichotomy of how they can regret motherhood but love their children. And for some, that story includes navigating living apart from their children, as well as why women who regret motherhood can go on to have another child. Chapter Five discusses whether mothers should be silent or speak to their children about their regret. Donath and the women chew on questions like these: Do you protect them by not telling them? Do regretting mothers protect themselves by not telling them? How does not telling them endanger them? In the “Mothers as Subjects” chapter that follows, Donath discusses how we need to challenge the assumption that “adaptation to and satisfaction with motherhood” depends on the conditions under which they raise their children. Here and throughout, she pushes the narrative to raw truths. And the women themselves speak those truths. Reading the women’s words will grip you, and maybe like me, at times make your heart hurt as you read about their inner turmoil, suffering, guilt, and self-doubt brought on by pronatalist society. Near the end, Donath asks, “What are the consequences of silencing regret over motherhood? Who pays the price when we try to pretend it does not exist?” Part of who pays the price are people trying to decide whether they want to become parents. Like with all pronatalist myths, we have a responsibility to help people see beyond the myths related to motherhood regret, so they don’t make the mistake the women in this book (and many more) feel they made. May this trailblazing work serve as the first of more voices from different countries on this important issue. Thank you, Orna Donath! As a woman who wrote about my ambivalence about the time, physical and emotional energy that it takes to raise kids (I have 3, all grown), I applaud this book. Sometimes our biggest fear is admitting the “dark side” of a decision…the hardest parts or moments. Once we reveal those, will people we love judge us or feel unloved by us? There are no easy answers. But starting the conversation is the first step. More women with children can dispense with the platitudes–being a mom is NOT the most important role in the world. Full stop. Mother/child love also is not the truest form of love–try telling that to my 30-something year old kids. With time comes perspective. With experience comes the chance to share our voices.